An air compressor is a very useful equipment in a garage but choosing the right one for your garage is a difficult task. The choice will depend primarily on your need. Since you are going to use it for minor works, you will not need a large commercial air compressor. A small and easy to use compressor will be okay for your garage. You can buy either a gas powered compressor or a compressor that works on electricity. Gas powered compressors are used mainly by large construction companies whereas electric compressors are ideal for home use. If your garage doesn’t have electricity, a gas powered compressor, of course, will be your only option. Again you have to consider its size and weight. If it is a small gas powered air compressor, you can take it to places where you need it. An electric compressor has to be at a place where there is facility to plug it in to electric supply. When it comes to gas powered air compressors, there are again a number of choices. Compressors of different shape and size are available and some of them are mounted on wheels for easy portability. Which compressor to choose again depends on how and where you are going to use it. If you need to move it very often, a compressor mounted on wheels will save you the trouble of having to lift it. Since we are talking about a compressor for your garage, a vertical, hot dog or pancake air compressor will be just fine. If you have an electric outlet in your garage, you can forget about the gas powered air compressors and pay attention only to electric compressors. They are much easier to use. Gather as much information as possible about the different types of electric compressors and choose the one that suits your needs the best. Reading product reviews online is a good way to learn about the pros and cons of electric compressors. When you buy your compressor, check its pressure output and see whether it will be sufficient for your needs. 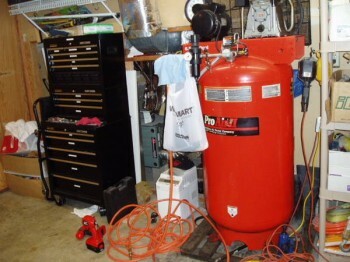 The larger the air tank, the more pressure the compressor can provide. Since it for your garage, you don’t need a very large air tank. Depending upon the tools you are going to use, you can choose a medium sized air tank for your compressor. If you need the compressor just for inflating your car tires or driving nails down, an electric compressor can satisfy your needs. Furthermore, you don’t have to buy gas for the compressor and there won’t be any environment pollution. Places where you will find air compressors of all types are Lowe’s and Home Depot. Before you make your final choice, let the salesman know of your needs and what you are going to use the compressor for. This will help him to find the most suitable air compressor for you. Remember to clarify all your doubts before you leave the store. Other places where you can search for air compressors are Google search and DIY.com.